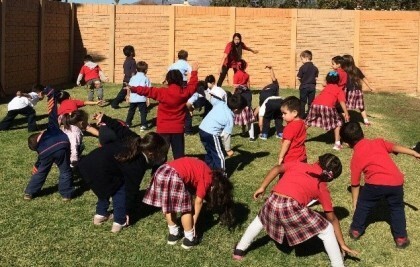 During a meeting at St. Anthony’s Preschool in San Gabriel, California, one staff member – a personal trainer at the local gym – suggested implementing regularly structured physical activities for entire school. This idea blossomed into “Workout Wednesdays.” On Wednesday mornings, before going inside, students gather outside for a workout. Students and teachers participate in yoga, stretching, relay races, obstacle courses and other fun activities. Little Cruiser Child Care Center in Miami wanted to focus on increasing physical activity for their infants and toddlers. Staff decided to create better play environments. The director and teachers put their heads together and thought of ways to add play spaces that infants and toddlers can use indoors and outdoors.